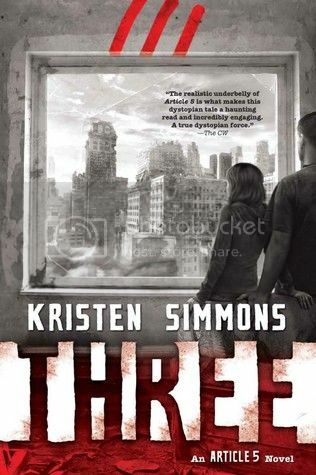 ‘Three’ is the third and final novel in the ‘Article 5' series by Kristen Simmons. I have really, really enjoyed this series from the very beginning, and I absolutely hate to see it end. First off, I have to admit that I was terrified to read this final novel. (There is a certain book that I read recently that has ruined me for series endings.) I didn’t know what to expect, and I was afraid to see what was going to happen to these characters that I love so much. Chase and Ember are such excellent characters. I have loved them since the very first book. Watching them grow as characters, as well as watching their relationship grow, has been such a great experience. I love that these two characters were always true to themselves and to each other. And they fought for what they believed in, even when they weren’t on a ‘side’. I love this about them. I love them period. It’s not only these two characters that I love; there are so many secondary characters in the book that you can’t help but love. The characters that we’ve followed from the very beginning - like Sean and Rebecca - on to the characters that we are just introduced to in this novel -like Jesse- you will care for them all in some way or another. Simmons has written all of their stories so well that you will be completely captivated by them all. 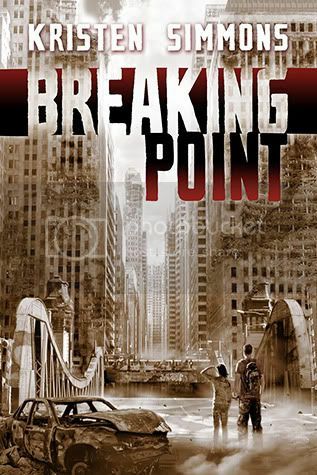 The dystopian storyline for this series it so very creative; I absolutely love it. It’s very realistic and something that I could definitely see happening if a twisted government were in command. The tension and suspense in this novel was nerve racking. It was killing me at times waiting to see what was going to happen to these characters and to see how the series was finally going to come to an end. I felt that the ending of the book was very well done. While there were some things that I hated to see happen, they did and I must move on from that. I felt that wonderful sense of closure when I finished the last pages, and I love that feeling when I finish a really great series. I also love that my hometown – Chattanooga – is included in the novel! (Even if it is just for a page or two, it’s there!) I had to fangirl a bit when I saw that. So when you read the novel and you see Chattanooga, remember me! Overall; I cannot think of a better ending to this series. Kristen Simmons, you nailed it! 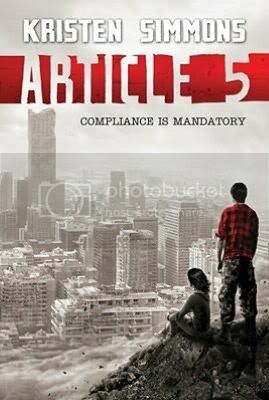 If you haven’t check out the Article 5 series yet, I definitely recommend that you do so. The series definitely will not disappoint. Now that I’ve read the book, I will be patiently waiting for my finished copy to arrive to add it to my collection. This is definitely a series that I will read again! It's always fun when you see your town included in a book! Gives instant connection. I enjoyed the first one but haven't read these -- now I can read both in a row. Woo-hoo!